Bottled at 90.4 proof, Woodford Reserve delivers a rich, smooth flavor with complex citrus, cinnamon, toffee, chocolate and spice notes. The finish is well-rounded and smooth. 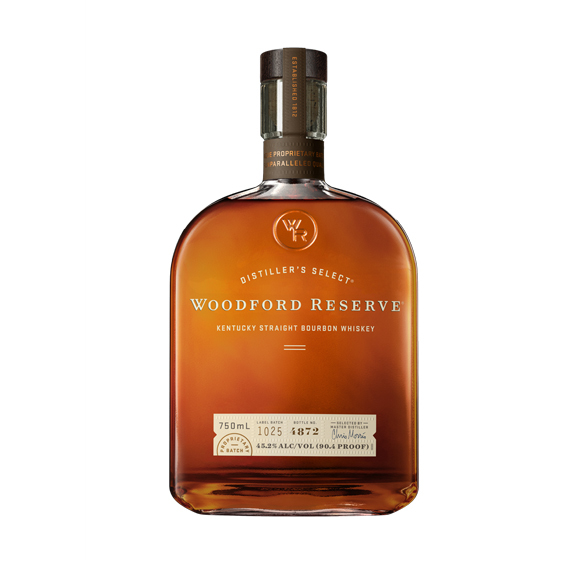 Woodford Reserve Distiller’s Select is a super-premium, small batch bourbon that is a product of the historic Woodford Reserve Distillery, located in the heart of Kentucky’s Bluegrass Region. Woodford Reserve has quickly become a highly acclaimed, award winning bourbon which is savored by consumers worldwide. It is a bourbon of exceptional richness, depth, and character with a smooth, well-rounded finish. An innovative approach to twice-barreled bourbon creates the rich and colorful flavor of Woodford Reserve Double Oaked. Uniquely matured in separate, charred oak barrels – the second barrel deeply toasted before a light charring – extracts additional amounts of soft, sweet oak character. In the early 1800s, our Woodford County Distillery, thanks to owner Oscar Pepper and Master Distiller James Crow, was the site for landmark discoveries and innovative techniques in bourbon-making. Woodford Reserve’s Master Collection honors the pioneering work of Pepper and Crow, applying their handcrafted methods to a variety of grain recipes, fermentation styles and maturation processes to create a range of unique whiskeys.